This letter is written to Miss Martha Berry. 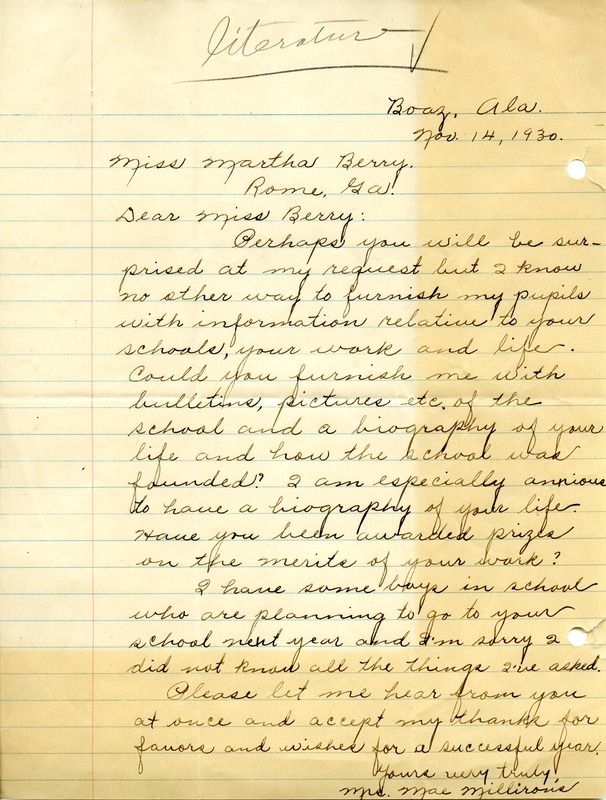 At the request of the author, Miss Berry is asked to send bulletins and pictures of her school as well as a biography of her life. According to Mae, there are boys who are interested in attending Miss Berry's school the following year. However, two of them want to know more about Miss Berry and the school before they attend. Mrs. Mae Millirons, “Letter from Mae Millirons to Martha Berry.” Martha Berry Digital Archive. Eds. Schlitz, Stephanie A., Christy Snider, Angela McCavera, Chelsey Whitmiller, Maria Para, Brandon Sherbo, et al. Mount Berry: Berry College, 2013. accessed April 26, 2019, https://mbda.berry.edu/items/show/13429.